When you're walking on ice, you need a pair of shoes that will support you and help you prevent injury. If you are searching for the best shoes for walking on ice, consider the bottom of the shoe first. For walking on ice, you want a shoe with large treads, or raised patterns, to help your feet keep their grip on the ground. In addition, rubber soles will prevent you from slipping and help you keep your balance. The best shoes have completely waterproof soles. Inside the shoe, look for good insulation: the best shoes for walking on ice will have linings made of Thinsulate or other materials created to keep warmth locked in. Finally, make sure the shoe has stability features, like a well-cushioned heel cup and insole, to help support your body weight. Although materials and construction play the biggest role in creating the best shoes for walking on ice, shoppers commonly overlook other important factors. Make sure your shoe fits snugly; if it doesn't, no amount of technology will keep you from slipping on ice. In addition, don't automatically discount lightweight shoes. While in the past, the best winter shoes were made out of heavier materials, today's technology allows manufacturers to create high-quality winter shoes that are far less heavy than they once were. Examine the construction of the shoe and try it on before you discount it. While most shoe stores carry shoes for regular walking, they won't necessarily carry the best shoes for walking on ice. To find these shoes, search stores geared toward outdoor athletes, such as REI or Sierra Trading Post. These stores often have hiking boots and other types of shoes specifically created for harsh conditions and help let you find the perfect shoe for you. While these retailers do have websites, buy your first pair of shoes for walking on ice in person so you can examine their construction up-close and make sure they fit your foot snugly. After you have worn them for a while and seen if they work for you, feel free to purchase your second pair online. Normal walking shoes cost between $40 and $100. However, shoes for walking on ice will cost significantly more, as they use high-tech materials and more complex engineering. Expect to pay about as much as you would for a running shoe: between $80 and $120 is a good range to keep in mind. 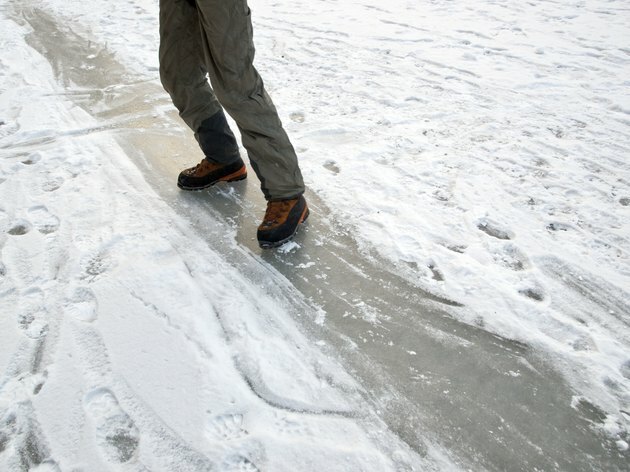 While this may seem steep, the best shoes for walking on ice will keep you from slipping and falling, preventing injury. Therefore, they're worth the extra money you will spend. How Does It Benefit Me to Wear Hiking Boots Instead of Tennis Shoes on the Trail?